7. Change the Repeater SSID(name) and Security key to EXACTLY match the SSID and password of your Wifi network. Click "Apply". NOTE: Any setup or product problems, pls fell free to contact us at awanka@163.com, we are still online for you. ❤ 3 IN 1 FUNCTION: Router Mode, Repeater Mode, AP Mode.Buy one,but get three function. Intelligent roaming, Change modes under different kinds of networking. ❤ HIGH PERFORMANCE: Compatible with 802.11 a/b/g/n, High Speed Transmission speed up to 300Mbps, ideal for Video Streaming, Web Browsing, Online Gaming and File Downloading. 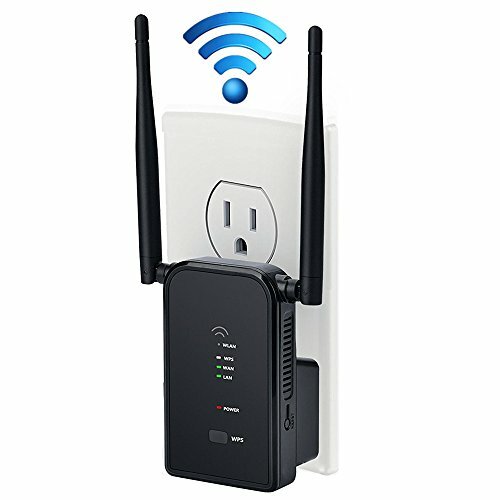 ❤ DUAL EXTERNAL ANTENNAS:Dual External Antennas provide better wireless performance in penetrating walls, transmitting across multi floor house and eliminate wifi dead area. ❤ UNIVERSAL COMPATIBLE:Compatible with any mainstream wireless network devices that comply with the agreement of 802.11n/b/g under 2.4GHz like iPhone, iPad, ASmartphones, Samsung, Tablet, PC, Computer, Desktop. ❤ EASY INSTALLATION: Small size and wall-mounted design make it easy to deploy, one-touch wireless security encryption with WPS button.